Exactly twenty years ago, in 1999, under the leadership of Franck Biancheri, we launched Project Europe 2020 in Athens – a project to reinvent Europe along the lines of democratisation, efficiency, transparency, sustainability and connection to the world. A reinvention where citizens would not be spectators, but actors. 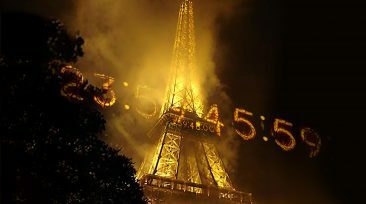 It was this project that later gave rise to the Europe 2020 think-tank, which was itself transformed into LEAP in 2005. 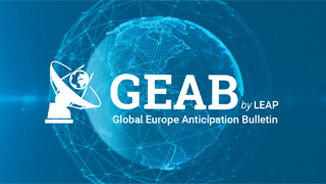 It is with this founding vision of the challenges facing Europe that the GlobalEurope Anticipation Bulletin was born. Indeed there is no potential for anticipation without a vision for the future, without a “tension” towards tomorrow. It is because we had a stake in ‘tomorrow’ like that our gaze turned in this direction and gradually sharpened, becoming accustomed to identifying both obstacles and open pathways in the middle of the density of events of which this ‘tomorrow’ is composed. But it will not have escaped you: now 2020 really is tomorrow! Several years ago, we considered changing this date and extending the horizon of our vision. Then we decided that this date was the only relevant one for the generation of Europeans we represent (even if, taken individually, our team is composed of different ages, we feel we are generationally marked) and that we would continue to aim for this horizon, taking responsibility for the goals we had set ourselves at the beginning rather than avoiding them by extending deadlines. But that doesn’t mean we’re going to stop there. In 2019, we are preparing for the launch of LEAP2040, which essentially consists of a generational renewal. Hence, the year 2019 will be devoted to working with teams of young Europeans with whom we will adopt the twin approach of training/transmitting our knowledge (particularly in terms of methodology) and reflecting on the crises, challenges and main guiding objectives that are emerging on this new horizon. We should be able to announce the launch of LEAP 2040 by September 2019 at the latest. 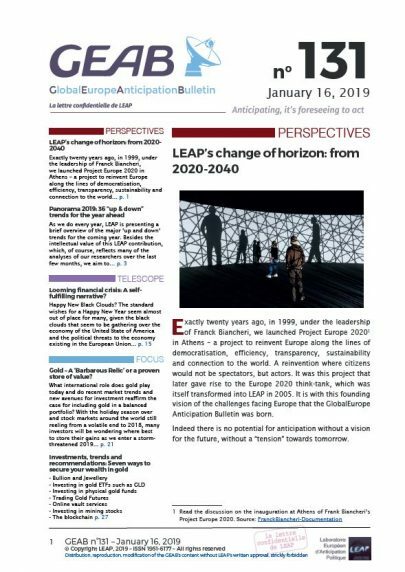 Thanks to this cross-generational approach of LEAP, the GEAB will be given a good new vantage point to continue its work of illuminating the future, combining the methodological experience of the first generation with the enlightened vision of a new generation now tending towards this new horizon. Each generation has its own horizon and project! For our part, we have decided to call ourselves, quite simply, ‘Generation Europe’. After a ‘Generation War’ of Europe’s founders, then a ‘Generation America’ of baby boomers, we believe that there is a ‘Generation Europe’, born in the 1960s/70s, which saw the borders disappear, was able to study abroad in Europe rather than in the United States (thanks to the Erasmus programme) and was reaching professional maturity when the ‘seal’ of European integration represented by the euro was introduced. It was this generation that had the task of consolidating the technocratic structure left to it by the ‘Generation War’, which ‘Generation America’ should have passed on to it twenty years ago. Unfortunately, the plethoric nature of the baby boomers led to a mechanical crushing of ‘Generation Europe’, which was unable to properly articulate its political project for Europe and its citizens, not having had a voice in the matter despite all its efforts and perseverance (so well represented by Franck Biancheri’s political career). Now that the baby boomers are retiring and finally giving way (two decades too late), it is the next generation that is arriving in key positions: the Macron, Kurz and Di Maios, who are having to go back to the national level to actuate their project, for lack of a consolidated European action base. However, it would be so much easier for them to act from this level, particularly in view of the challenges that must now be met, all of which have a global dimension: the environment, e-society, world peace, global governance, etc. We believe that our generation, this famous ‘Generation Europe’, must now connect with the next one, the one born in the 1990s. We choose to call it ‘Generation World’ because it is the generation that will have to stabilise the fragile ‘last minute’ consolidation work of the European edifice (which we describe in the ‘Up & down trends 2019’ below) so that Europeans can take their place in the organisation of the new global society that will be inaugurated in 2020. We would like to take this opportunity to thank you once again for contributing, via your subscriptions, to the realisation of the actions, reflections and projects that animate our think-tank. As you know, GEAB subscriptions are our only source of funding. Without the GEAB, without you, there is no LEAP. Thank you for your support and best wishes for this new year, for which we have identified the 38 key trends explained below. 2 Like it or not, it is America that is the reference or horizon for this generation. And this is to be expected since this generation, born after the war, and therefore without any perception of the European project, studied abroad in the United States alone (let us remember that the flows of students before the Erasmus programme were almost exclusively directed from Europe to the United States and not the other way around). This generation trained professionally in the Cold War world, where the United States of America was the only model. We are obviously talking about the collective dynamic; it goes without saying that each of these generations is composed of different individuals. Looming financial crisis: A self-fulfilling narrative? Gold – A ‘Barbarous Relic’ or a proven store of value? First semester of 2019 – Anger of nations, Balkans, end of the QE, Special Purpose Vehicle, Brexit, Elections… Europe: Countdowns are on!